Various materials, shapes and thicknesses. 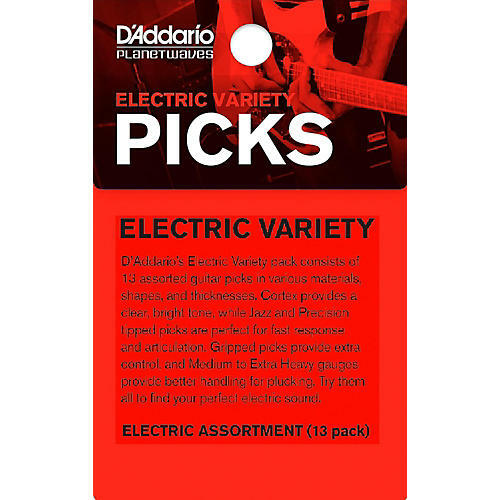 D'addario's Electric Variety pack consists of 13 assorted guitar picks in various materials, shapes, and thicknesses. Cortex provides a clear, bright tone, while Jazz and Precision tipped picks are perfect for fast response and articulations. Gripped picks provide extra control, and Medium to Extra Heavy gauges provide better handling for plucking. Try them all to find your perfect electric sound. Discover which pick works best for you. Order today.